Fully articulated, 8-inch tall Bob Wilson / Don Carter Deluxe Action Figure! 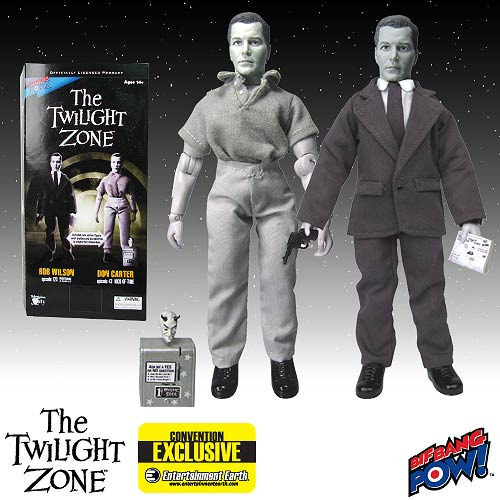 Comic-Con Exclusive based on Rod Serling's enduring The Twilight Zone TV series. Features one action figure body along with clothing and accessories to recreate William Shatner's image from two episodes: "Nightmare at 20,000 Feet" and "Nick of Time." Entertainment Earth Comic-Con Exclusive! Bif Bang Pow! 's incredible line of fully articulated action figures grounded in Rod Serling's enduring The Twilight Zone TV series rolls on with this extraordinary figure. The 1970s-style figure stands 8-inches tall in shades of black and white and features episode-fabric clothing, in addition to multiple points of articulation and an all-new head sculpt officially approved by William Shatner. It would make an excellent collectible and appreciated gift for any Twilight Zone aficionado! Limited edition of 1,500 individually numbered pieces. Features one action figure body along with clothing and accessories so you can recreate William Shatner's image from two episodes: "Nightmare at 20,000 Feet" and "Nick of Time." True to William Shatner's performance in the captivating "Nick of Time" episode from November of 1960, this Don Carter Action Figure sports accurate clothing (including his watch) and a miniature Mystic Seer fortune-telling machine accessory! If you're hooked on The Twilight Zone, you need this! Based on the spine-chilling episode "Nightmare at 20,000 Feet" that featured William Shatner and the ultra-creepy Gremlin, this terrific action figure presents former mental patient Bob Wilson with handgun and newspaper accessories, just like in the show. If you don't order this, you too may come to doubt your sanity!